We started a new series, this week, as a family read aloud, with Lisa M. Cottrell-Bentley's Wright on Time, Arizona (click the link to go to the author's website). The series, of easy reader, chapter books, follows the travels of the Wrights, a homeschool family of four (two children, and two adults), who have taken to their RV for a year or two, to travel the country, state by state. So far, there are four books in the series, Arizona, Utah, Wyoming, and South Dakota. I downloaded the first book, Arizona, to my laptop, as a Kindle book (the print version costs $12.99 at Amazon, but the Kindle versions are only $2.99, and you can download Amazon's Kindle software for free to your computer, if you do not own a Kindle), thinking, somewhat naturally, that I'd found a geography series, to read with the children. As it turns out, it's really more of a science series, with a geography backdrop. In Arizona, the Wrights visit a cave, for some exploring, and mining, finding not only bats, and interesting things, like stalagmites, stalactites, and soda straw formations, as well as too many gems and minerals to name here. There is a glossary at the back, and in the Kindle version, at least, glossary words are underlined in the story. We found the first book in the series to be well written, and entertaining, as well as educational. The learning flows naturally from the narrative, without being forced. Homeschooling is dealt with in a matter of fact way, without being mentioned too often. And, at least in book one, there is no mention of the family's faith, one way or the other. They are just a homeschool family, on a long series of field trips. The books would be too simple for my oldest two (ages 12 and 14), to enjoy reading on their own, but they have been happy to listen along, while I read them out loud to the younger children. And, there have been enough interesting facts, and just enough of a hint of a mystery, to keep all of us interested, and engaged. It's a promising series. To find out what other families are reading this week, click over to the What My Child is Reading link-up, hosted by Mouse Grows, Mouse Learns. I just put this on my list at the library. 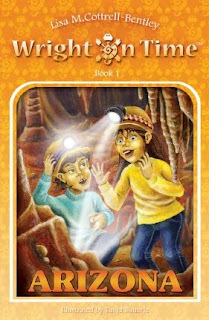 I am always on the look out for books with homeschooling characters to give as gifts. This could be an option for a Christmas package. Thanks for the heads up. Sounds like a nice series. I didn't know there was an app for a kindle for your computer. I might just have to check that out. That definitely sounds interesting, we are learning about the US and we try to incorporate science. That looks really interesting. Did you notice they have lapbooks for the books, too? Ooh, this sounds interesting. I have a hunch that daughter will start begging to get an RV and hit the road :) Thanks for joining WMCIR! We love these books! We started with the first one, and haven't put them down since. We look forward to each new book coming out! Thanks for the recommendation...I need to investigate! This series looks great! I can't wait to get started on these. Thanks! Sounds like a good book. Do your kids want an RV now to travel around and do school in? Jackie H - Most definitely.